Port of Oakland’s Free Harbor Tours are BACK for 2018!!!! But there’s a catch. You may only register online on the first Monday of each month at 7PM Pacific Standard Daylight time(that’s local time). There are only 230 spaces available on each free tour of the harbor and you may reserve up to 4 tickets(per hour). You know how people are, each will reserve 4 even if they do not even know 4 people or plan on going. So these tickets will fill up within minutes. However, they know that half the list will fake and allow for walk-ins if you show up 30 minutes early on the date of the tour. They claim that on previous tours due to the fake factor, they have accepted most walk-ins, if not all. I myself used to work in IT at the Port of Oakland and was lucky enough to go on this tour a few times back in 2008. 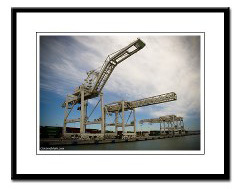 In fact, it is where my iconic Port of Oakland Cranes photo came from. Being on this tour. This tour was canceled for a great many years and I think this maybe it’s grand return so it will fill up fast. It’s pretty amazing and you get to hear a lot of facts and history you just may have never learned otherwise. It is also a great chance to take pictures of the cranes! You won’t just take the normal ferry route, you will dip into the Port of Oakland to a part you’ve never had access to buy ferry. If you love the Oakland Cranes, be sure to learn about the Star Wars rumor. Parking? You may park at the Jack London Garage or anywhere in Jack London Square. But at a price of course. Public Transit? BART does not go to JLS but AC Transit does from Downtown BART. Where do I get tickets? As mentioned, the link above, on the first Monday of each month at 7pm. What if I could not get a ticket? As mentioned, show up 30 minutes beforehand(or more) and hope for the best. How long is the tour? 90 minutes! What boats will be used? You will be on one of the Blue & Gold Fleet ferries. Where do the tours start from? The Jack London Ferry Terminal in Oakland, CA across from the Port of Oakland building. How many tickets are available per tour? 230 per tour. When does registration open? First Monday of each month at 7pm. First come, first serve. There you have it folks! Get on the list for your free Port of Oakland Harbor Tour for 2018 and enjoy 90 minutes of inside information. I cannot find the dates for the City of Oakland free harbor tours. I’d like to take my two grandchildren living in S.CA on one of these tours.